“We do whatever it takes around here!” — Ben. Mike Tomlin calls his quarterback “a sick competitor.” The description seemed especially apt Monday night at Heinz Field, where Ben Roethlisberger pretty much lost his mind in the pursuit of victory. Roethlisberger turns 33 in March. He does not have the security of a new contract. His body has absorbed untold punishment in the form of 406 sacks and countless hits. Yet there he was in the second quarter, diving head-first into the shins of Houston linebacker Whitney Mercilus in hopes of giving Antonio Brown an extra second to throw. The result was a Brown-to-Lance Moore touchdown that went a long way toward the 99th victory of Roethlisberger’s career. One question, Ben: Why did you do that? So yes, “sick competitor” fits. “Prolific winner” does, too, even after back-to-back 8-8 seasons (Roethlisberger has never had a losing one). If the Steelers beat the Indianapolis Colts on Sunday, Roethlisberger will improve his record to 100-50 and reach 100 wins faster than all but three quarterbacks in NFL history. And those three quarterbacks (Tom Brady, Joe Montana, Terry Bradshaw) own 11 Super Bowl rings combined. This isn’t some statistician’s phony milestone. It’s not consecutive games with 15 completions for 150 yards. This is 100 wins. This is big, even if Roethlisberger downplayed it Wednesday. You can read more here, including “seven snapshots culled from those 99 wins”. “He’s got it all. His anticipation, his vision, his awareness, especially when things are breaking down and [he is] finding guys and dumping the ball off and getting to his check-downs. 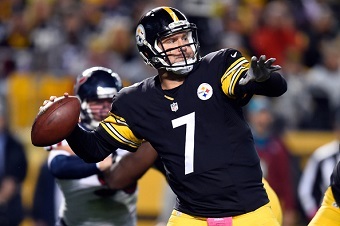 He’s playing really good football.” — Colts coach Chuck Pagano on Ben. Only three quarterbacks in the history of the NFL won their 100th game by their 150th start. Two are in the Pro Football Hall of Fame, the other is headed there. They are Terry Bradshaw, Joe Montana and Tom Brady. Ben Roethlisberger can become the fourth. 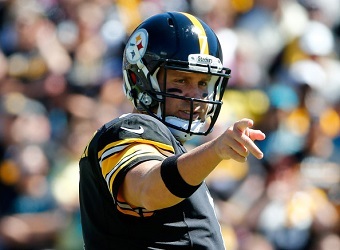 All he and the Steelers must do is beat the Indianapolis Colts Sunday at Heinz Field. It will be his only chance to match the other three because that will be Roethlisberger’s 150th regular-season start. “I guess if you play long enough, you’re going to get those milestones,” was Roethlisberger’s reaction. Well, no, not this one. Plenty of quarterbacks played many years without achieving 100 wins, never mind in their first 150 games. Roethlisberger always maintained that his most important statistic is wins and this would put him in rare company, not to mention two of the other three having strong Pittsburgh connections. Bradshaw and Montana each won four Super Bowls, Brady has three, Roethlisberger two. “The guy is just a tremendous quarterback, he’s a future first-ballot Hall of Famer,” Colts coach Chuck Pagano said. Pagano knows what it’s like to prepare his team to play against Roethlisberger. As the Baltimore Ravens secondary coach and then defensive coordinator from 2008-11, his defenses went against Roethlisberger six times in the regular season (Roethlisberger missed two games against the Ravens in that time) and two playoff games. With Roethlisberger playing, the Steelers went 6-2 in those games, including both in the postseason. “I’ve gone against him obviously numerous times, some good and a lot of bad,” Pagano said. Pagano detailed why it was so difficult preparing to play Roethlisberger. “He’s big, he’s strong, he’s accurate, he’s got great, great vision, strength. You can’t get him down in the pocket. The way he’s able to throw on time, throw on rhythm, throw the deep ball and the way he can extend plays and escape and brush off would-be blitzers and things like that and find guys, it’s amazing.